New York, Chicago, London – December 11, 2017 – Vela, the premier market access technology provider, today announced the support of Bitcoin futures. Firms that wish to take advantage of the new Bitcoin futures contracts from Cboe Futures Exchange (CFE) and CME Group Inc. (CME) will be able to receive market data and trading access without delay from launch. Data and trading access to the Nasdaq Bitcoin Futures contracts will also be available on launch in 2018. As part of an ongoing program of product enhancement, Vela has been monitoring market appetite for new instruments and has been well prepared as the announcements regarding Bitcoin futures have been made by CME, CFE, and most recently by Nasdaq. 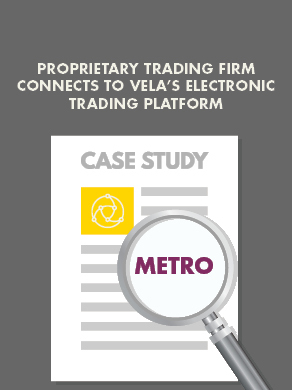 Vela’s solutions for both data and market access are designed, developed, and built to support the continued growth of clients’ automated trading strategies. Vela supports over 200 global markets and covers a wide range of asset classes including futures, options, equities, foreign exchange, and fixed income. Adding Bitcoin is a logical extension to existing capabilities. CFE announced today, Monday, December 11, 2017, as its first full day of Bitcoin futures trading. CME will begin trading Bitcoin futures on December 18, 2017 and Nasdaq is planning to introduce futures trading in the first half of 2018.